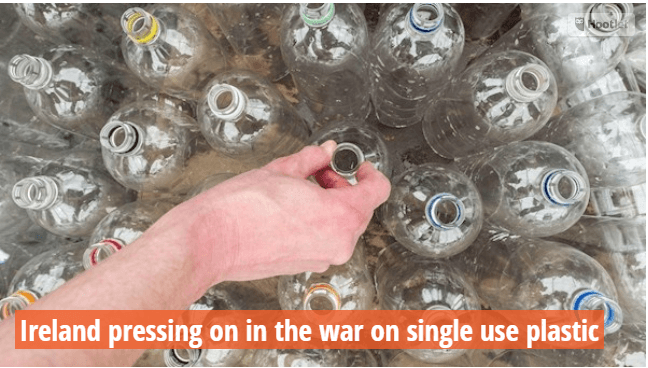 The war on single-use plastic has begun in earnest in Ireland with businesses, environmental groups, and a prominent GAA club joining the battle to cut its use. Building material group, Kingspan, has partnered with a foundation that removes plastic from the ocean and plans to reuse as much of the plastic recovered as it can in the production of insulation products. Kingspan plans to use 500m recycled plastic bottles a year in its insulation products by 2023. The three-year partnership with the EcoAlf Foundation will see it help to remove up to 150 tonnes of waste from the Mediterranean each year. Friends of the Earth and Voice Ireland have launched Sick Of Plastic, a nationwide campaign to cut the use of plastics. Pointing out that Irish companies, shops and households generate twice the EU average of plastic waste, the organisations want a nationwide deposit-return scheme, a tax on single-use cups and a ban on single-use plastics. They are also demanding that supermarkets reduce plastic packaging. Last year the campaign mobilised thousands of consumers to leave their plastic packaging behind in supermarkets in protest against single-use, non-recyclable packaging. Meanwhile, Youghal GAA has joined the environmental initiative Refill Ireland to refilling reusable water bottles at refill stations and ditch single-use plastic bottles. As a way of promoting the use of reusable water bottles, Youghal GAA is signing up to Refill Ireland to encourage club members, players, visitors and members of the public to fill their water bottles at its outdoor tap. “When this initiative was brought to our attention we didn’t need much convincing that this is a very good idea for both the community and for our club,” said Eochaill Óg chairman, Hugh Dorrian.